Reading and share top 121 famous quotes and sayings about Carried Away by famous authors and people. Browse top 121 famous quotes and sayings about Carried Away by most favorite authors. 2. "Getting carried away is stupid, it won't get me anywhere.-Nana Komatsu"
3. "You make all these decisions in your life, and they all seem like the right decisions at the time. You think you're doing the right thing. And it's only later that you realize, no, they were exactly the wrong decisions, and instead of bringing you what you wanted, they only carried you even farther away from your dreams. And somehow you've got to live with that." 4. "Anyone who has ridden the subway twice a day to earn their bread knows how it goes: When you board, you exhibit the same persona you use with your colleagues and acquaintances. You've carried it through the turnstile and past the sliding doors, so that your fellow passengers can tell who you are - cocky or cautious, amorous or indifferent, loaded or on the dole. But you find yourself a seat and the train gets under way; it comes to one station and then another; people get off and others get on. And under the influence of the cradlelike rocking of the train, your carefully crafted persona begins to slip away. The super-ego dissolves as your mind begins to wander aimlessly over your cares and your dreams; or better yet, it drifts into ambient hypnosis, where even cares and dreams recede and the peaceful silence of the cosmos pervades." 5. "Is it that they think it a duty to be continually talking,' pursued she: 'and so never pause to think, but fill up with aimless trifles and vain repetitions when subjects of real interest fail to present themselves? - or do they really take a pleasure in such discourse? ''Very likely they do,' said I; 'their shallow minds can hold no great ideas, and their light heads are carried away by trivialities that would not move a better-furnished skull; - and their only alternative to such discourse is to plunge over head and ears into the slough of scandal - which is their chief delight." 6. "And that heart which was a wild garden was given to him who loved only trim lawns. And the imbecile carried away the princess into slavery." 7. "Tell me, Laurel, whatdo you know of erosion? "Laurel couldn't imagine what this had to do with anything, but she answered anyway. "Like when water orwind wears away the ground? ""That's right. Given enough time, wind and rain will carry the tallest mountain into the sea. But," he said,raising a finger, "a hillside covered in grass will resist erosion, and a riverbank may be held in place bybushes and trees. They spread their roots," he said, extending his hands with his story, "and grab hold. Andthough the river will pull at the soil, if the roots are strong enough, they will prevail. If they cannot, theywill eventually be carried away too." 8. "But you know: you know that if I could have stayed, if I could have gone on, that I would have clutched every second: whatever it was, this death, you know that it came and took me, like a child carried away by goblins." 9. "I try hard not to preach, but I get carried away, which is a mistake, but it's a risk worth running." 10. "Covered with a white blanket. The keen wind still carried the howling of the dogs, though this grew fainter as we went on our way. The baying of the wolves sounded nearer and nearer, as though they were closing round on us from every side. I grew dreadfully afraid, and the horses shared my fear. The driver, however, was not in the least disturbed. He kept turning his head to left and right, but I could not see anything through the darkness. Suddenly, away on our left I saw a faint flickering blue flame. The driver saw it at the same moment. He at once checked the horses, and, jumping"
11. "I had never known the pleasure of reading, of exploring the recesses of the soul, of letting myself be carried away by imagination, beauty, and the mystery of fiction and language. For me all those things were born with that novel." 12. 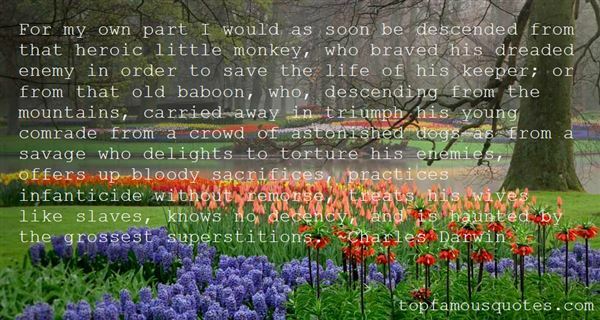 "For my own part I would as soon be descended from that heroic little monkey, who braved his dreaded enemy in order to save the life of his keeper; or from that old baboon, who, descending from the mountains, carried away in triumph his young comrade from a crowd of astonished dogs—as from a savage who delights to torture his enemies, offers up bloody sacrifices, practices infanticide without remorse, treats his wives like slaves, knows no decency, and is haunted by the grossest superstitions." 13. "She carried a scabbedover wound on her hip where her mate had bitten her two weeks before somewhere in the mountains of Sonora. He'd bitten her because she would not leave him. Standing with one forefoot in the jaws of a steeltrap and snarling at her to drive her off where she lay just beyond the reach of the chain. She'd flattened her ears and whined and she would not leave. In the morning they came on horses. She watched from a slope a hundred yards away as he stood up to meet them." 14. "A writer falls in love with an idea and gets carried away." 15. "But if, like a bold painter, you had first sketched in a few audacious strokes the outline of the picture you had in your own soul, you would then easily have been able to deepen and intensify the colors one after the other, until the varied throng of living figures carried your friends away and they, like you, saw themselves in the midst of the scene that had proceeded out of your own soul." 16. "In Israel we tend to be carried away by our emotions." 17. "How could he maintain the apology in his eyes without getting carried away by her cherubic innocence?" 18. "People do get carried away and make mistakes, but one must have indulgence; those mistakes are merely evidence of enthusiasm for the cause and of abnormal external environment"
19. "But the next morning, while night owls slept, I climbed trembling to her cubicle and woke her, weeping aloud with a crazed love that lasted until it was carried away without mercy by the violent wind of real life." 20. "For the city, his city, stood unchanging on the edge of time: the same burning dry city of his nocturnal terrors and the solitary pleasures of puberty, where flowers rusted and salt corroded, where nothing had happened for four centuries except a slow aging among withered laurels and putrefying swamps. In winter sudden devastating downpours flooded the latrines and turned the streets into sickening bogs. In summer an invisible dust as harsh as red-hot chalk was blown into even the best-protected corners of the imagination by mad winds that took the roofs off the houses and carried away children through the air." 21. "They had picked up Julie's scent hit wolfsbane lost her and found her trail again at the crumbling Highway 23 except it was two hours old and mixed with horse scents. She was hitchhiking. Great. Awesome. At least she always carried a knife with her. When I relayed this to Curran he shrugged and said, "If she kills anybody we'll make it go away." 22. "I want to glide in a world of beauty,' I said. ‘To be carried away into a world of luxurious things." 23. "The wind blew my words away from you. So while I told you I love you, the phrase was carried in the opposite direction and landed 333 miles away in the ears of a confused farmer. He was nice, though. He sent me a kind letter saying that while he was flattered, I wasn't really his type." 24. "You are lucky that I can't sing tonight because I might get carried away." 25. "Daniel's face-- the way it had been bathed in violet light when he'd carried her home this morning-- appeared before her eyes. His gleaming golden hair. His tender, knowing eyes. The way one touch of his lips transported her far away from any darkness. For him, she'd suffer all of this, and more." 26. "He was a jackass to nearly have kissed her last night, but that was all. It was a moment, one in which he easily got carried away because of how she looked up at him with liquid-filled, blue eyes that nearly drowned his soul." 27. "[from Some words about 'War and Peace']In those days also people loved, envied, sought truth and virtue, and where carried away by passions; and there was the same complex mental and moral life among the upper classes, where were in some instances even more refined than now. If we have come to believe in the perversity and coarse violence of that period, that is only because the traditions, memoirs, stories, and novels that have been handed to us, record for the most part exceptional cases of violence and brutality. To suppose that the predominant characteristic of that period was turbulence, is as unjust as it would before a man, seeing nothing but the tops of trees beyond a hill, to conclude that there was nothing to be found in that locality but trees." 28. "The main qualities that had earned him this universal respect in the service were, first, an extreme indulgence towards people, based on his awareness of his own shortcomings; second, a perfect liberalism, not the sort he read about in the newspapers, but the sort he had in his blood, which made him treat all people, whatever their rank or status, in a perfectly equal and identical way; and, third - most important - a perfect indifference to the business he was occupied with, owing to which he never got carried away and never made mistakes." 29. "The only institution in the Sicilian conscience that really counts is the family; counts, that is to say, more as a dramatic juridical contract or bond than as a natural association based on affection. The family is the Sicilians' State. The State, as it is for us, is extraneous to them, merely a de facto entity based on force; an entity imposing taxes, military service, war, police. Within the family institution the Sicilian can cross the frontier of his own natural tragic solitude and fit into a communal life where relationships are governed by hair-splitting contractual ties. To ask him to cross the frontier between family and State would be too much. In imagination he may be carried away by the idea of the State and may even rise to being Prime Minister; but the precise and definite code of his rights and duties will remain within the family, whence the step towards victorious solitude is shorter." 30. "I've carried a gun for 10 years. I've carried them in the locker room, and nobody really knows about it. I know how to handle myself, and I stow it away where nobody really knows about it." 31. "When you've loved somebody for a long time, and then it stops, it's akin to an amputation in that you go on feeling the cut-off part long after it's been taken away. All sorts of nervous and emotional impulses set out to travel to their accustomed stations, and when they come up against the new, raw barrier, they're carried through it by their own impetus, and only then, finding themselves shooting through empty space, do they dwindle and die away." 32. "Feel free to get....carried away as often as you like." 33. "My father has developed a tradition of surprising us at some point by appearing in fancy dress. He buys a new costume each year and typically gets carried away. A couple of Christmases ago he appeared in an inflatable sumo outfit. It's endearing, really, and only quite embarrassing." 34. "We need to be together." "Why?" I asked softly. The word was carried away on the wind, but he heard. "Because I want you." I gave him a sad smile, wondering if we'd meet again in the land of the dead. "Wrong answer," I told him. I let go"
35. "Both carried, despite their martial postures, an aura of sorrow, though ghosts of smiles flickered across their faces. They would have recognized one another from a mere turn of the head observed from hundreds of yards away on a moonless night in January." 36. "But there comes a point (and this is the challenge facing modern technological Western man) when the cult of technique destroys feeling, undermines passion, and blots out individual identity. The technologically efficient lover...has lost the power to be carried away; he knows only too well what he is doing. At this point, technology diminishes consciousness and demolishes eros. Tools are no longer an enlargement of consciousness but a substitute for it and, indeed, tend to repress and truncate it." 37. "Turning her face away from him, she let the tears fall at last. They were carried away on the wind as if they'd never been. Much like her." 38. "Perhaps tonight you'll meet someone who'll make you want it that much. "Alex rolled her eyes at the idea. "It's a night at Almack's, Eliza, not an enchanted ball. Let's not get too carried away." 39. "They forgot their lives for a moment, abandoned all fear, every thought and troubling notion carried away on the back of the breathtaking melody." 40. "I was carried away, swept along by the mighty stream of words pouring from the hundreds of pages. To me it was the ultimate book: once you had read it, neither your own life nor the world you lived in would ever look the same." 41. "Carried away. He got a little carried away. This is like saying Hitler was a tad aggressive." 42. "When you are drowned by your sorry state, and you feel as if you are carried away from the road that leads to your desires, you should know that you are the one responsible for being led away from the right path." 43. 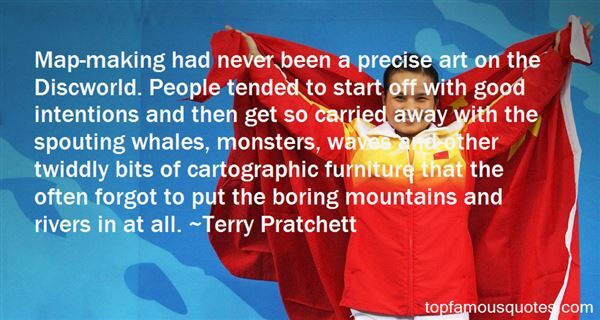 "Map-making had never been a precise art on the Discworld. People tended to start off with good intentions and then get so carried away with the spouting whales, monsters, waves and other twiddly bits of cartographic furniture that the often forgot to put the boring mountains and rivers in at all." 44. "And gears," said Anathema. "My bike didn't have gears. I'm sure my bike didn't have gears. "Crowley leaned over to the angel. "Oh lord, heal this bike," he whispered sarcastically. "I'm sorry, I just got carried away," hissed Aziraphale." 45. "We have negative mental habits that come up over and over again. One of the most significant negative habits we should be aware of is that of constantly allowing our mind to run off into the future. Perhaps we got this from our parents. Carried away by our worries, we're unable to live fully and happily in the present. Deep down, we believe we can't really be happy just yet—that we still have a few more boxes to be checked off before we can really enjoy life. We speculate, dream, strategize, and plan for these "conditions of happiness" we want to have in the future; and we continually chase after that future, even while we sleep. We may have fears about the future because we don't know how it's going to turn out, and these worries and anxieties keep us from enjoying being here now." 46. "On an evening in the latter part of May a middle-aged man was walking homeward from Shaston to the village of Marlott, in the adjoining Vale of Blakemore, or Blackmoor. The pair of legs that carried him were rickety, and there was a bias in his gait which inclined him somewhat to the left of a straight line. He occasionally gave a smart nod, as if in confirmation of some opinion, though he was not thinking of anything in particular. An empty egg-basket was slung upon his arm, the nap of his hat was ruffled, a patch being quite worn away at its brim where his thumb came in taking it off. Presently he was met by an elderly parson astride on a gray mare, who, as he rode, hummed a wandering tune." 47. "No one could understand; nor could she explain it herself. This senseless kindness is condemned in the fable about the pilgrim who warmed a snake in his boson. It is the kindness that has mercy on a tarantula that has bitten a child. A mad, blind kindness. People enjoy looking in stories and fables for examples of the danger of this kind of senseless kindness. But one shouldn't be afraid of it. One might just as well be afraid of a freshwater fish carried out by chance into the salty ocean. The harm from time to time occasioned a society, class, race or State by this senseless kindness fades away in the light that emanates from those who are endowed with it. This kindness, this stupid kindness, is what is most truly human in a human being. It is what sets man apart, the highest achievement of his soul. No it says, life is not evil." 49. 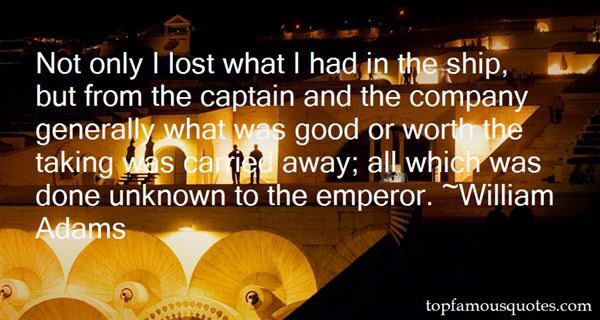 "Not only I lost what I had in the ship, but from the captain and the company generally what was good or worth the taking was carried away; all which was done unknown to the emperor." 50. "I cannot tell if what the world considers ‘happiness' is happiness or not. All I know is that when I consider the way they go about attaining it, I see them carried away headlong, grim and obsessed, in the general onrush of the human herd, unable to stop themselves or to change their direction. All the while they claim to be just on the point of attaining happiness." Interesting, but she could see that the boy didn't have a single lie in him. A very rare condition, especially for the male of the species."